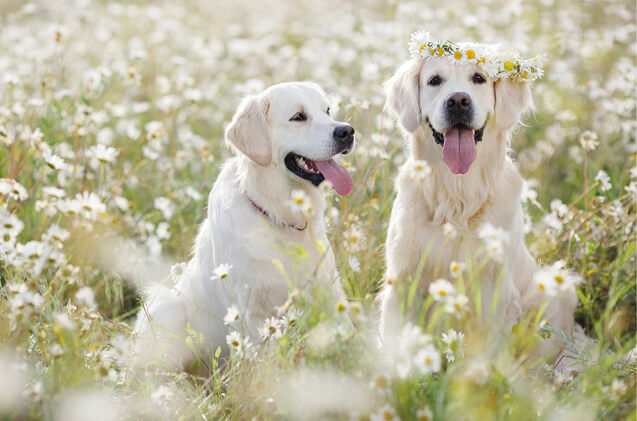 Spring is right around the corner, and with the change of season comes new activities, and new chances for your pet to get into some things that could potentially make them ill. In honor of March 18th through the 24th being “National Animal Poison Prevention Week”, The Drake Center has come up with the top 5 spring time hazards you should be aware of. It probably comes as no surprise to you that chocolate is a big no-no. A potentially lethal dose of chocolate for a 16lb. animal is only 2oz. of baker’s chocolate. If ingested, this could can be very dangerous and cause intestinal blockage. If you are worried about keeping it away from your pet, try substituting tissue paper. You may not know, but lilies are extremely toxic to cats. They have a tendency to chew on them, and any part of the lily could potentially cause kidney failure. Warmer temperatures for these bugs means it is baby making season! Although they seem like nuisance pests, they are disease carriers and capable of causing severe health problems. A flea egg can remain dormant for over a year, until ideal temperature is reached. Fleas are carriers of disease including the plague and also serve as an intermediate host for tapeworms, both of which are potentially hazardous to you and your family as well. Mosquitos main risk to your pet’s health is they are a carrier for heart worms. Ticks carry many different diseases and it is important to remove the tick as soon as you find it. A common tick-borne disease is lyme disease, and in some cases your pet may be allergic to a tick bite. To avoid a parasite infestation, it is best to use a preventative product year round that targest pre-adult fleas, such as Sentinel (for dogs) or Program (for cats). In addition, you should be using a product that targets adult fleas, as needed. We recommend Bravecto or Comfortis. The fertilizers that are sprayed onto lawns are typically fairly safe, unless they ingest it directly. If a fertilizer is ingested in large amounts, it may be toxic causing gastrointestinal irritation or obstruction. If ingested in a small amount it may cause mild stomach upset and loose stool. This compound is toxic to both dogs and cats; however, cats are especially sensitive. Commonly found in plant care products, this compound can be life threatening, even in small amounts. This pesticide contains metaldehyde, which is highly toxic to dogs and cats. Ingesting can cause seizures, vomit, diarrhea, and incoordination. Typically it is a sweet smelling substance, which inherently attracts pets. However, in recent years, California regulatory action has required snail bait to be unattractive to dogs. Therefore the number of of poisoning incidence have dropped significantly. However, even the “pet safe” snail bait contains 1% iron phosphate, and if ingested in large amounts can cause gastrointestinal upset. It is safer than metaldehyde, but still not 100% safe. Our pets are curious by nature, and they explore the world through their nose and paws- making them prime targets for insect stings. In most cases there will be mild swelling and tenderness. Be sure not to squeeze the stinger (causing more venom exposure); rather, use a credit card to scrape it out. Some pets are allergic to bee stings and will need emergency medical care. If your dog or cat starts vomiting or becomes lethargic after a bee sting, it is a sign of anaphylactic shock, and a clear indicator that they need immediate care. Before the ritual of spring cleaning commences, there are a few substances that you should be aware of. Clinical signs include red/raw skin, blistering, pawing at the mouth, severe drooling, not eating, and lethargy. If you believe that your pet has come into contact or ingested anything that is toxic, it is important that you contact your veterinarian immediately. You may also call the ASPCA Animal Poison Control at (888) 426-4435 (for a fee). Need to get in touch with us? Contact us, here.